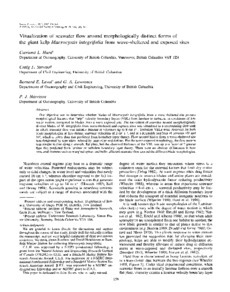 Copyright 1997 by the American Society of Limnology and Oceanography, Inc.
Our objective was to determine whether blades of Macrocystis integrifolia from a wave-sheltered site possess morphological features that "trip" velocity boundary layers (VBL) from laminar to turbulent in conditions of low water motion, compared to blades from a wave-exposed site. The movement of seawater around morphologically distinct blades of M. integrifolia from wave-sheltered and exposed sites was visualized in a recirculating flow tank in which seawater flow was initially laminar at velocities up to 8 cm s-1. Turbulent VBLs were observed for both blade morphologies at free-stream seawater velocities of 2 cm s-1, and at a Reynolds numbers of between 102 and 104, which is lower than that predicted from boundary layer theory. Flaw around blades from a wave-sheltered site was dominated by separation induced by large edge undulations. For the wave-exposed morphology, the flow pattern was similar to that along a smooth, flat plate, but the observed thickness of the VBL was up to a factor of 2 greater than that predicted from laminar or turbulent boundary layer theory. There were no obvious differences in how structural features such as marginal spines and bulbs affected seawater flow around the different blade morphologies.